The tame Layson Albatross, becalmed on the island of Rusa off New Ireland. It was fed from a bowl and kept inside at night for protection. First a few birding updates. The Laysan Albatross that we saw on the island of Rusa at the northern tip of New Ireland, Papua New Guinea was ringed as a chick on 1/6/1990 on the French Frigate Shoals in the Hawaiian Island chain. Ringed at location B and ring read in the field at location A. How many miles has this bird flown in the intervening 22 years? We have alsso had a few interesting ringing recoveries. A Fieldfare ringed in North Dorset in November last year was killed by a cat in central Sweden in the spring and a Sedge Warbler we ringed at Lytchett Bay last autumn was controlled as a breeding bird in Norfolk this spring. On 1st August I visited Brownsea Island to look for a White-rumped Sandpiper that had been seen the day before. I dipped, but later found that there had always been some doubt about the identification. We knew that the original finder of the bird came from the Rutland area and investigations by local birder Ian Stanley tracked him down. Photos and sketches of the bird on John Wright’s blog www.wrightswanderings.co.uk confirm that it wasn’t a pure White-rumped Sandpiper and a hybrid origin, possibly with a Dunlin, was postulated. The small wader or ‘peep’ can be seen at the bottom of the flock, just left of centre. 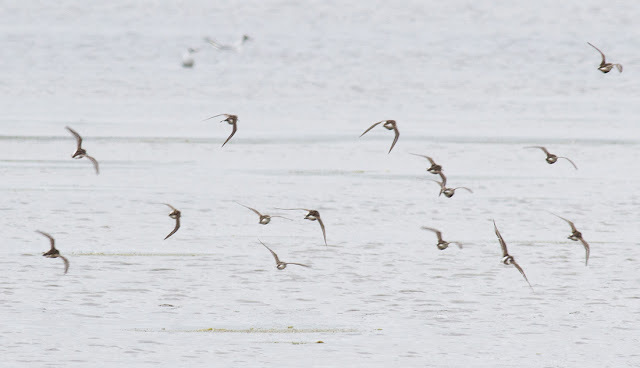 A fine black line down the white rump can be seen which is clearly wrong for a White-rumped Sandpiper. Click on the image to enlarge. Photo by John Wright. I had seen the Short-billed Dowitcher at Lodmoor on the 4th before its identification had been fully established. I returned with Margaret at the weekend but the bird was not on show. On the 13th the dowitcher showed OK, but no better than when I first saw it. However some excellent photos have been obtained by other birders. The one below was posted on Surfbirds website by Mike Lawrence. 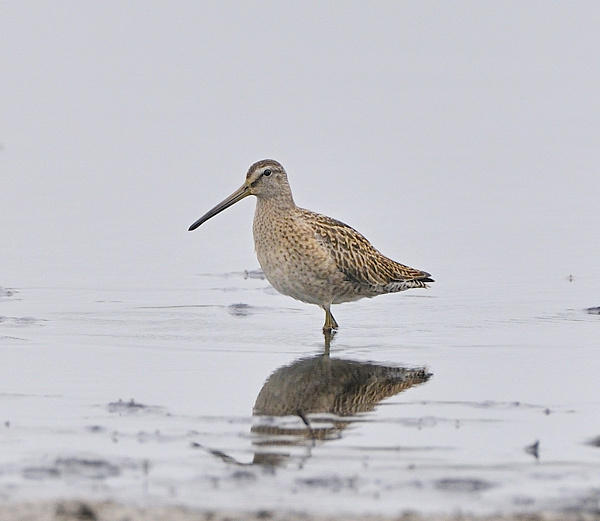 Short-billed Dowitcher, Lodmoor. The well-marked tertials can be seen. Photo by Mike Lawrence. Unlike the dowitcher this young Grey Heron showed very well. I continued on to Portland where a North American Monarch Butterfly had been seen for the last few days. It is presumed that the butterfly arrived on the same winds that brought the dowitcher, however a population of Monarchs exists on the Canary Islands (presumably a result of an earlier trans-Atlantic invasion) and some postulate it may have come from there. The local paper states that ‘over a thousand Lepidopterists have descended on Portland’. This should really have a read ‘a small number of Lepidopterists and a thousand twitchers (who came to Lodmoor see the dowitcher and made a short drive to see an unusual butterfly) descended on Portland’. Monarch Butterfly usually occur in the UK following the passage of fast-moving autumnal weather systems, the same systems that bring American birds to our shore. Monarch butterflies are highly migratory and travel from all over North America to winter in their millions in a few valleys in Mexico. I continued on to Portland Bill where few birds were in evidence but we had a good views of the old paddle steamer ‘the Waverley’ that now runs tourist cruises around the coast. Two interesting moths that Martin had caught overnight … Beautiful Gothic …..
« 5th – 11th September – Friends and Family update.